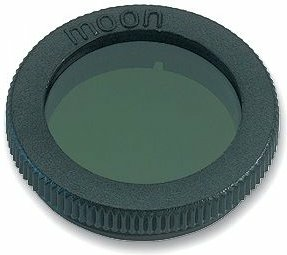 This Celestron moon filter ensures that the brightness of the bright moon is reduced, preventing it from blinding you. An added advantage of the Celestron moon filter is that it enhances the contrast so that details become clearer. The surface will thus show much more detail. This 1.25 inch filter has an aperture ratio of 21 mm and a light transmission of 18%. This was included as a free gift with the purchase of a telescope. In all honesty with the excitement of the telescope itself, i neglected to use this in my first moon viewing. The filter however is an essential in my opinion for prolonged viewing, the moon is obviously very bright and can dazzle the eyes! On second opportunity to view i used the filter. Its a very simple attachment which screws on to the lens with ease and the immediate relief on the eye makes it well worth having in a setup. It will obviously put a slight difference in hue with what you see, but if your spending time to examine detail it shouldnt bother you. If considering as an individual purchase its definitely worth having in your set up. Used it for the first time last week. Amazing filter! Clearly gives a better image of the moon. A useful accessory. You have to place the filter loose in the eyepiece. I don't like it. That doesn't make it easy to remove.